The following important information has been compiled from the Palestine Solidarity Campaign website, with thanks. Ahed, a 17 year old Palestinian girl living in the Israeli-occupied Palestinian West Bank, is facing years in an Israeli jail because she was caught on video slapping an Israeli soldier. Ahed Tamimi is a 17-year-old girl from the village of Nabi Saleh in the West Bank, illegally occupied since 1967 by Israeli forces. Ahed and her family are prominent activists and have been demonstrating against Israeli military rule for over a decade. Nabi Saleh in particular has had most of its land and spring taken by the Israeli army for the benefit of the nearby settlement of Halamish. As a result of the village’s resistance, members of the Tamimi family have been explicitly and systematically targeted by the Israeli state; they have had work permits revoked, many have been arrested and imprisoned, and both a cousin and an uncle of Ahed’s were shot dead by the Israeli army. Ahed’s father, Basem Tamimi, has been incarcerated nine times. In 1993, he was interrogated through means of torture to a degree that left him comatose for over a week. Ahed’s mother, Nariman Tamimi, has been arrested and injured by the Israeli army multiple times in recent years, including an injury sustained from live ammunition. On the day of Ahed slapped the Israeli soldier, her 15 year old cousin Mohammed, had been shot in the face with a rubber bullet by the Israeli army. Ahed thought he had been killed, and he has in fact been very severely injured. Her family, like other West Bank villagers, live in constant fear of the Israeli soldiers and the settlers. They suffer the daily indignity of check-points, house demolitions, theft of land and water, violence and arbitrary arrest. Ahed dared to protest at the army’s violation of her family’s right to their home and to life itself. The soldier that she slapped had just fired teargas shells into her house and was standing on her family property. On the 19th of December 2017, Ahed was arrested from her family home under the cover of darkness. Her mother, Nariman Tamimi was arrested the same day when she went to inquire about her daughter at the local Israeli police station. Nour Tamimi, Ahed’s cousin, was arrested the following day. Nariman was arrested on suspicion of incitement, for having allegedly filmed and uploaded the incident to Facebook. She, her daughter Ahed, and Ahed’s cousin Nour Tamimi, have been since served with inflated indictments. While Nour has since been released, Ahed and her mother Nariman have been remanded into open-ended detention until the end of legal proceedings in their cases. 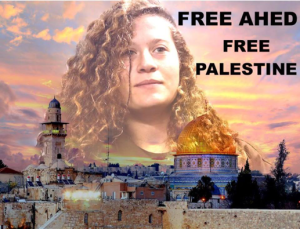 Ahed is detained in Hashron prison, where she spent her 17th birthday on the 31st of January. The 12 count indictment filed against her includes charges of assault and incitement. Under Israeli military law, each and every one of these charges is independently punishable by up to a maximum of between 5 to 10 years in prison. She will be tried behind closed doors in an Israeli military court based on Israeli military orders where the conviction rate is above 99%. Ahed has been charged with assaulting an Israeli soldier and will be tried in a military court. Israel is the only country in the world that prosecutes children though military courts. The Courts have a conviction rate of 99%. Like other Palestinian child prisoners, some as young as 12, Ahed has endured aggressive interrogations, sometimes at night, where threats have been made against her family and where she also has been subjected to emotional abuse. Ahed is one of hundreds of Palestinian children arrested under military law. 313 Palestinian minors were in Israeli prisons at the end of November 2017, mostly charged with throwing stones. The arrest of Ahed Tamimi has shone a spotlight on Israel’s systematic abuse of minors through the process of military detention. The treatment of Ahed has rightly generated a global response, but her situation is far from unique. • forced to sign confessions (often in Hebrew – a language they do not understand). Currently there are 300 Palestinian children in Israeli prisons and over 8,000 have been arrested since the year 2000. UNICEF has described Israeli detention of Palestinian children as amounting to "to cruel, inhuman or degrading treatment or punishment". The demand to release Ahed Tamimi, her mother and all other child prisoners must be made immediately. The Israeli military court system also has to be condemned and governments around the world must ensure that they are not aiding and abetting this system through financial or military aid.